My families world was turned upside down in June 2014. I’ve decided to share it here on our family blog to possibly help someone going through the same thing. I’ve searched high and low for months for support groups and finally found one online. I have so many questions and concerns that really only someone who’s gone through this, can help with. 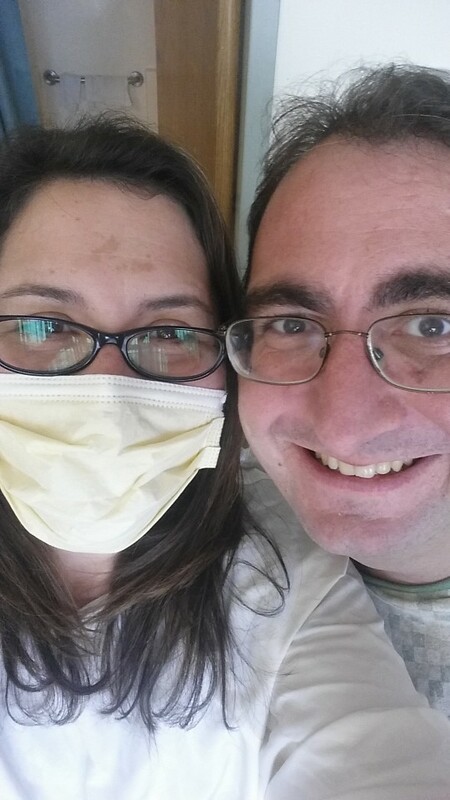 On Friday May 30, 2014 my husband Steve came home complaining of chest pains. He was thinking he had gas and then ate dinner. After dinner it didn’t get any better so he stayed home while I took Holly to her softball game. I made him promise me that if it got worse, he’d take an aspirin. He assured me he wasn’t having a heart attack. Later that night he still had the pain so we starting thinking more about what it could be from. Since Tums didn’t seem to make a difference but did make him burp, we knew it wasn’t gas. At this point we started talking about how it could be his gallbladder. Having had mine out before, the area of the pain he was having, seemed to be about right for what I experienced. He took some pain medicine and tried to sleep. By about 1 AM it seemed to go away. He had a doctor’s appointment on June 3, 2014 with his regular doctor so he was going to ask her about getting an ultrasound to see if it was indeed his gallbladder. He was hoping that wasn’t the case because he didn’t want to have to have surgery at the beginning of the summer so his recovery didn’t get in the way of swimming in the pool with the girls. Saturday, Sunday and Monday he felt fine. We had dinner at my parent’s house to celebrate my birthday one day early since Tuesday was a very busy day for us with the girl’s activities. After dinner we came home, he gave them showers and was then on the couch playing with Max (our 14lb Boston Terrier). Max stepped on Steve right in the area where the pain had been a few days earlier and he was immediately in a LOT of pain. It took his breath away it was so painful. After a few minutes of it not letting up, I suggested he take some ibuprofen, which he did. The pain continued so I finally suggested we just go to the hospital. My thinking was if it was his gallbladder than there was obviously a problem if our little dog could cause it to hurt that much. Steve didn’t disagree and I called my mom to come stay with the girls. This was about 7pm on 6/2/14. The ER was pretty quiet at our local hospital so they saw us immediately. They took his vitals and then ordered a chest x-ray, ekg and an ultrasound of his gallbladder. While the doctor (PA) was examining Steve, he noticed he was sweating a lot so he asked him about that. Steve told him that he was a little nervous so that probably was causing the sweating. I took this opportunity to speak up and point out that he’s had really bad night sweats for a while now, to the point he has to change out his pillow quite often. That lead to us talking about his most recent trip overseas which he head returned from 10 days ago. The doctor asked him where he went (Dubai) and asked how long the flight was (12 hours). He asked more about Steve’s travel history and his line of work. Steve filled him in on all the places he travels to for work. He then asked him about how he had been sleeping (terrible!) and if he had lost any weight recently. Steve lost almost 40lbs since right before Christmas. However, he had been cutting down and trying to balance out his meals better to control his Diabetes he recently discovered he had. The doctor then ordered some blood work as well. The EKG was fine (I was so happy to hear that his heart was healthy!). The x-ray of his chest showed nothing. The ultrasound of his gallbladder was unsuccessful since he had eaten just a few hours before. Then we just had to wait for his blood work. At this point it was about 10pm and the doctor said all his blood work looked great except for one. He ran a D Dimer test since Steve had been traveling on a long distance flight recently. The D Dimer can detect if there have been any blood clots. The test came back high. The pain in his chest and test being high told them he could have a blood clot in his lungs so now they have to do a CT Scan. Of course he also told us that sometimes it’s a bad test because it can also mean other things. But they couldn’t let him leave without the CT Scan. So now we waited about another 2 hours to get the CT scan. Sometime after midnight, Steve wished me a happy birthday. He was happy to be able to be the first one to do it. 🙂 Then they finally came to take him for his CT Scan. Around 130 – 2 AM the doctor came into the area were were in, grabbed a chair for himself to sit in, closed the curtain and looked like death. We both knew that, that wasn’t good. And then the doctor went on to tell us that “it wasn’t good”. There was no sign of a blood clot, however there were masses of tumors in his lungs and liver. MASSES of them. Steve and I froze. We didn’t know what to think. We never expected to hear this… EVER. The doctor went on to say it could be a number of things but they didn’t know what. But he also said it isn’t good and we needed to find out what is causes these like yesterday. He suggested that we admit him in the hospital right away so they can begin testing the next day. He said if we left and tried to make appointments with doctors, it would take weeks or even months and he didn’t think we should wait that long to find out what was happening. Steve didn’t want to stay. When he left the house he told the girls he’d see them in the morning. He didn’t want to not be there and break his promise. I told him I would take the girls to see him first thing in the morning but he needed to stay here and find out what is going on. After a little while he knew that was the right thing to do so he agreed. The doctor we were dealing with was only a PA so he was now going to talk to the doctor in the ER to see about getting Steve admitted. Once the doctor looked over everything and read the report on Steve’s travels, he suspected that he could possibly have TB. So now they have to keep him and they also have to isolate him. By 6am on 6/3/14 they moved him to a private isolation room and when I arrived at the hospital I was told I had to wear a gown, mask and gloves. I opted to not wear the gloves. If Steve had TB then so did I. I wasn’t going to catch anything more than I probably already had. They ordered tons and tons of blood work. They ordered an ultrasound of his testicles to rule out testicular cancer. They ordered a PSA test to rule out prostate cancer. They ordered a CEA test to see if there were any tumor makers. They ordered a CT Scan of his abdomen to see if there were any tumors visible. They ordered a biopsy of his liver, unless something else showed up in is CT scan that was easier to biopsy. They ordered a TON of blood work to test for infectious diseases. That afternoon, on June 3, 2014 the oncologist stopped in to talk with us. He told us the biopsy will tell us everything. I asked him if he saw the ct scan himself or if he read the report about it. He said he saw it himself. I asked him to the best of his knowledge, what did it look like to him. He told me that to him it suspiciously looked like Cancer. But a Biopsy was needed to know for sure. He also told us if it was cancer, it did not start in either the lungs or the liver, it’s spread to both those areas. That was when Steve and I accepted the fact that he had cancer. Later that night they did the ultrasound of his testicles and drew more blood for the PSA and Tumor marker test. The next morning, 6/4/14 they told us his testicles looked fine and his PSA was 1.1. The tumor marker test came back high but they said that just shows there are tumors, but they could be benign. Then they did another CT Scan of his abdomen before the biopsy was done. They were hoping to find a mass somewhere else that they could biopsy instead of the liver. The 2nd CT scan verified what they saw on the original one, that there were spots/lesions/masses/tumors on his liver and lungs, but nothing in his colon. They said his pancreas looked good and his lympnodes were swollen. They expected to see swollen lympnodes since there was obviously something going on. Now they were going to do the biopsy the next morning. The infectious disease doctor still hadn’t ruled out everything but at the end of the day 6/4/14, they were able to rule out TB. The next morning 6/5/14 they did a liver biopsy. It was a simple needle biopsy and Steve said it didn’t really hurt too much and he was feeling fine. Shortly after that biopsy the doctor in charge of the case came in to tell us that they did a quick look under the scope and it was indeed cancer, now they needed to put the sample through all sorts of tests to see where the cancer started since there is no obvious starting point. At this point Steve and I had already accepted the cancer diagnosis so nothing really changed, it was just verified at this point. They then discharged him and told him to make a follow up appointment with the oncologist to get the final results of the biopsy, next week. So we went home.